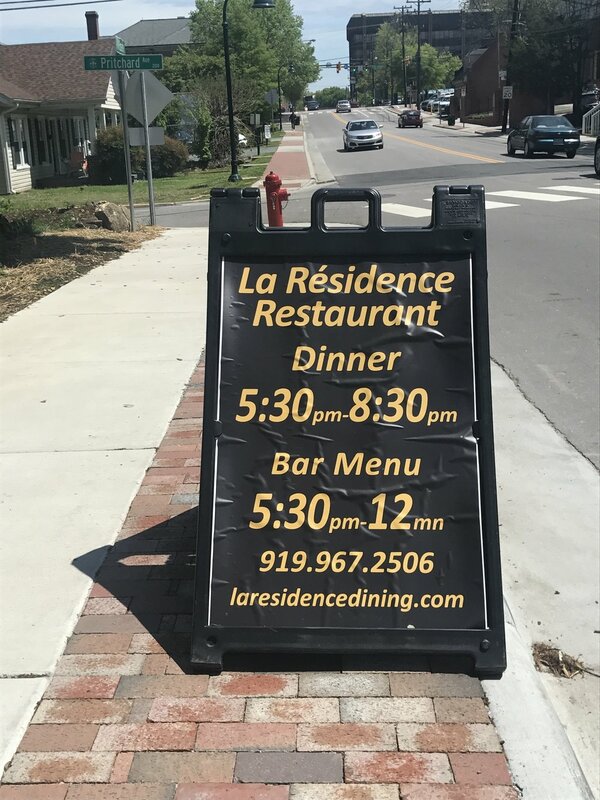 La Residence Restaurant is celebrating 43 years of providing fresh, local, and delicious food to Chapel Hill customers. Originally a restaurant at Fearington Village, La Residence moved to 202 West Rosemary Street into a gorgeous old farmhouse with a unique history all of its own. 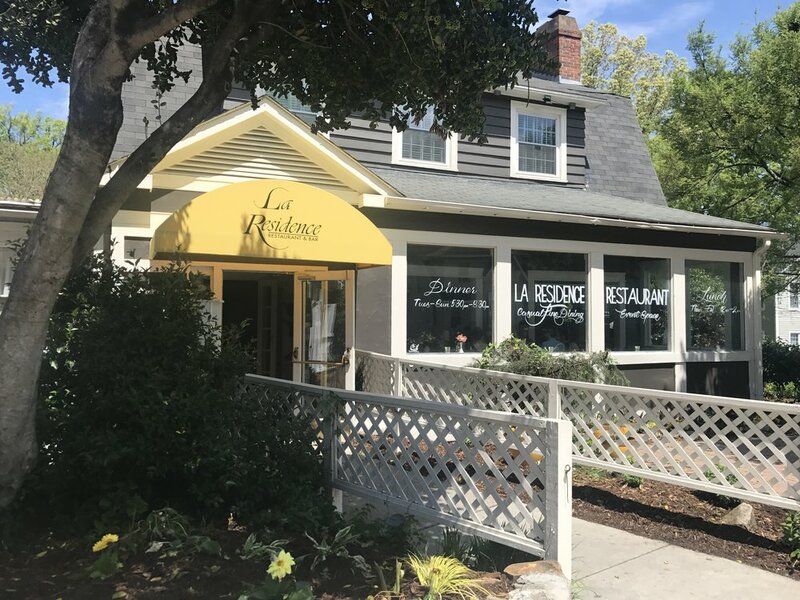 La Residence is family owned and operated by the Gualtieri family with mom Frances the matriarch. Sons John and Dieter grew up working at the restaurant; from mowing the grass outside, washing dishes, to now managing all staff and operations. Chapel Hill is a community that values sustainable practices and supporting local businesses; La Residence prioritizes ethical ecological practices and the local economy in every aspect of their operations. Purchasing Locally sourced and made furniture and equipment that is energy efficient; low flow toilets, energy star appliances, the table tops come from a design firm in Carrboro. Reducing waste by composting, telling their suppliers they prefer not to have products in nonrecyclable containers, returning boxes to delivery companies for reuse. Even small changes make a big difference; like using linen napkins not paper and printing their menus on recycled paper. But researching even further into the sourcing of products to ensure that the company that makes that recycled paper is regional; not 3000 miles away and impacting the environment with shipping. They are committed to continuous improvement by following new trends in ethical practices as well as training staff from the experienced chef to the newest, youngest staff members. In 2016, La Residence experienced a fire in their kitchen, started by a small AC unit. It happened at night and thankfully no one was injured. The restaurant suffered substantial physical impacts with smoke and water damage affecting everything in the restaurant that wasn’t glass or metal. Yet the Gualtieri’s turned a devastating event in to an opportunity to support their ecological practices. Instead of throwing away 100 chairs with cloth seats that had been damaged; John learned from a local furniture maker how to redo the seats! Along with reducing waste, reusing the chairs also provided their employees with work – helping them stay employed while the restaurant was rebuilt. Chef John Fearrington is serving up delicious local food too! John is an Orange County native whose parents were farmers here and in Chatham County. When he first came to La Residence, Frances challenged him to create a 5-course menu of items featuring locally grown tomatoes, even the dessert! John did it and served up a delicious tomato crème brulee! Located at 202 West Rosemary St., La Residence is open for dinner Tuesday through Sunday. It's high-season for them for special events, and with Mother's Day and UNC Graduation right around the corner -- definitely call ahead for reservations at 919.967.2506 or visit www.laresidencedining.com.